The proposed example is not what one should really do with signals, it is just for the purpose of studying. Signals are like wires normally that carries a rising edge. On low level architecture you may use a wire to say validate when results are safe to propagate. and a wire to clear the results. I do a simple component that just sets to 1 the bit at the nth position of a register according to the position of the wire/signal (could be used for multiplexing). Not being able to block your code, is even making a top half/bottom half strategy risky. Okay, I should have used only atomic operations in the top half (which makes me wonder what operations are atomic in python) such has only setting one variable and doing the queuing in the while loop, but I fear it would have been worse. Which means actually with python, you should not play with signals such as defined in stdlib since without blocking you have systematical race conditions or you risk loosing signals if you expect them to be reliable. I am playing with signals as I would be playing with a m68K interrupt (I would still block signal before entering the critical section). To achieve the blocking and processing of pending signals I would need POSIX.1 sigaction, sisget, sigprocmask, sigpending. Why python does not support them (in the stdlib)? If you feel it is a problem, then just remember binding C code to python is quite easy, and that on POSIX operating system we have everything we need. This solution given in stackoverflow is funky but less than having unprotected critical section: http://stackoverflow.com/a/3792294/1458574. I remembered opening books of Computer Science to learn algorithm when I began. And my first reaction was: it seems unnecessarily complicated like maths, but I must be an idiot since I learnt physics. So 15 years later I reopened Introduction To Algorithms By Thomas H Cormen, Charles E Leiserson, Ronald L Rivest, Clifford Stein. And I decided to see if my experience in coding would help me appreciate this book for all the knowledge it could bring me. I have a hard time understanding how it works. """bubbles down until it is correctly located. 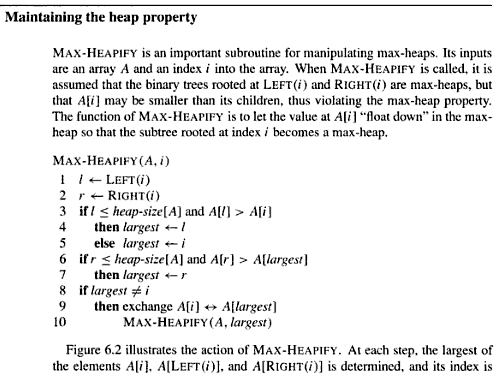 heap_size can be used internally for optimization purpose"""
And by coding it revealed what I feared the most: CS and computer developers don't live in the same world: the way a code is written matters. their code typography is even worse than mine. I have made python code to check the whole logic: writing a tinge more readable code does not seems to prevent it from working (I may have a problem on the boundary because this hidden heap_size variable is a pain to understand). By the way if you want really efficient heap structure in python please use : http://docs.python.org/library/heapq.html because it is just plain better, superbly documented, tested and the source code is quite nice too. Now, I am plain lost: when I check CS papers because I want to solve a problem I often stumble on unreadable pseudo code and verbiage. Understanding the API, the variable name ... takes an awful lot of time. When I write in python I have the feeling that it is a Pseudo Code Translator, so if we assume my implementation is close visually and logically from pseudo code, does it costs that much to improve pseudo code readability? If I can do it knowing that I am one of the most stupid developer among the one I know, why or how can't they do the same. Pseudo code is for sharing knowledge, do we really need to waste time de-ciphering these pseudo codes to be a real or better developer? When you see equivalent code in industry grade application, you normally hate that. It is plain bad practices. Isn't computer sciences supposed to teach elite grade developers? And when I see such code, I sometime wonder if the guy understood what he wrote. Meaningful variables names, test conditions, readability is what matters, because code is meant to be improved and fixed. With all these questions in my head I came to a conclusion: I don't take for profound what I think is uselessly obscure, so my opinion of CS papers and academics has dramatically dropped. EDIT: now, I see that bulbbling down and bubbling up can be extracted from the logic, and I guess it can be used to make a heap usable for min/max efficient inserting/extraction. So today, I dared open a bug on python. Which at one point should make me feel mortified, since it has proven that I misunderstood what a character is. A point is a punctuation mark, no? And variable names shouldn't use punctuation. Plus it looks the same, shouldn't it be considered the same? So I opened a bug and I was pointed very nicely to the fact that unicode characters "MIDDLE DOT" is indeed a punctuation but it also has the unicode property Other_ID_Continue. And as stated in python rules for identifiers, it is totally legitimate. That is the point where you actively search for a good documentation to understand what in your brain malfunctioned. Then a Perl coder pointed me to Perl Unicode Essentials from Tom Christiansen. Even if the 1st third is about Perl, it is the best presentation so far on unicode I have read. unicode is much more than simply extending the usable glyphs (that I knew, but I did not grasped that I new so little).